The major events of the Mexican Revolution (1910 - 1919) spanned the presidencies of William Taft (March 4, 1909 to March 4, 1913) and Woodrow Wilson (March 4, 1913 to March 4, 1921). Discover facts about the roles of William Taft and Woodrow Wilson together with details of the intervention of the United States of America. Interesting description and brief facts about US and Mexican Revolution History are detailed in the following Fact Sheet. The US and Mexican Revolution History is presented in a factual timeline sequence consisting of a series of short facts providing a simple method of relating the interesting history and information about the United States intervention and involvement in the 1910 Mexican Revolution. US and Mexican Revolution Fact 2: The Mexican-American War (1846-1848) erupted over unresolved border disputes. US and Mexican Revolution Fact 4: In 1910 the Mexican Revolution begins, led by Pancho Villa and Emiliano Zapata (see above for Causes of the Mexican Revolution). Zapata leads the peasant revolt in the south and Panch Villa leads the revolutionaries in the north of Mexico. US and Mexican Revolution Fact 5: Mexico's dictator, President Porfirio Diaz, was overthrown in 1911. US and Mexican Revolution Fact 7: President William Taft (March 4, 1909 to March 4, 1913) warns Mexico that US military action would take place if the lives and property of Americans living in Mexico were endangered. US and Mexican Revolution Fact 8: Americans owned 43% of the land in Mexico. Over 50,000 Americans owned property and lived in Mexico. US and Mexican Revolution Fact 9: American investment in Mexico was well over a billion dollars, including investments in railroads, oil and mines. Americans called for protection from the U.S. government. US and Mexican Revolution Fact 10: President Taft sent about 16,000 troops to Texas for "war games" on the US-Mexico border in April 1911, but did not allow them to intervene in the conflict in Mexico. The troops were withdrawn in August. US and Mexican Revolution Fact 12: The Ten Tragic Days: President Francisco Madero is assassinated on February 22, 1913 in Mexico City when Victoriano Huerta launched a coup, known as the Ten Tragic Days, with the support of Félix Díaz, the nephew of deposed president Porfirio Díaz. US and Mexican Revolution Fact 15: The Tampico Affair: The American investors supported Huerta, but President Wilson did not. In April 1914, nine American sailors from USS Dolphin were arrested and detained for an hour and a half for allegedly entering a prohibited zone in Tampico which became known as the "Tampico Affair". US and Mexican Revolution Fact 16: The arrest of the American sailors in the Tampico Affair gave President Wilson an excuse to invade Mexico when no apology was given to the US by President Huerta. US and Mexican Revolution Fact 17: President Wilson sent a fleet to the Gulf of Mexico. US and Mexican Revolution Fact 18: The Ypiranga Incident: The Ypiranga Incident occurred on April 21, 1914, at the port of Veracruz. President Wilson received a report that the SS Ypiranga, a German steamer, had been commissioned to transport arms and munitions to the Mexican federal government at Veracruz under President Huerta. US and Mexican Revolution Fact 19: The Ypiranga Incident: The report prompted President Wilson to order the port of Veracruz to be seized by U.S. Marines which led to the Battle of Veracruz and the US occupation of the town (although the arms aboard the SS Ypiranga did reach Huerta to avoid a diplomatic incident with Germany). US and Mexican Revolution Fact 20: The Battle of Veracruz and the occupation lasted from April 21,1914 - November 14, 1914. The U.S. troops prevented further arms from reaching Huerta and helped with the removal of Huerta from office by supplying the revolutionary forces of Venustiano Carranza with arms. US and Mexican Revolution Fact 21: The Battle of Veracruz: American Casualties in the 1914 Battle and Occupation of Vera Cruz numbered 22 killed in action and 70 were injured. US and Mexican Revolution Fact 22: By July 1914, the forces under Venustiano Carranza were able to take over the Mexican government, and Huerta was forced into exile. On November 14, 1914 the U.S. Marines were withdrawn from Veracruz. US and Mexican Revolution Fact 23: World War 1 (1914 - 1918) breaks out in Europe July 28, 1914 but the United States does not enter WW1 by declaring war on Germany until April 6, 1917 - Refer to American Entry into WW1. 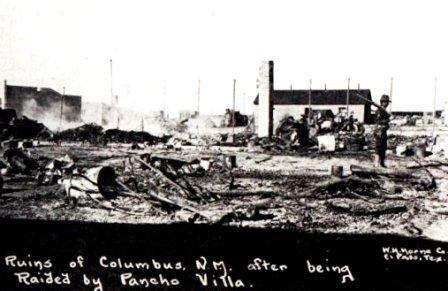 US and Mexican Revolution Fact 25: The Battle of Columbus - March 9, 1916: The Battle of Columbus began as a raid conducted by Pancho Villa's Division of the North on the small US border town of Columbus, New Mexico. Eight soldiers and 10 civilians were killed and 6 soldiers and 2 civilians were wounded. The United States government wasted no time in responding. US and Mexican Revolution Fact 26: The attack infuriated Americans and President Wilson ordered the Pancho Villa Expedition in which the US Army invaded Mexico in an attempt to capture Panch Villa. US and Mexican Revolution Fact 29: The United States declared war on Germany on April 6, 1917 and entered into WW1 and the punitive Pancho Villa Expedition was withdrawn from Mexico. US and Mexican Revolution Fact 30: On April 10, 1919 Zapata was killed in an ambush arranged by President Carranza. US and Mexican Revolution Fact 31: Alvaro Obregon supported by Zapatistas, Villistas, and other revolutionary groups overthrow and kill President Venustiano Carranza on 21 May 1920. US and Mexican Revolution Fact 32: Alvaro Obregon becomes President of Mexico and the Mexican Revolution ends. US and Mexican Revolution Fact 33: As a result of the political instability and violence of the revolution in Mexico, a huge influx of Mexican immigrants fled to the United States - refer to Mexican Migration. The article on US and Mexican Revolution facts provides useful information about this important subject. The following video will give you additional interesting facts, history and dates about the personal and political lives of all the US Presidents.